Compartment Storage Boxes Separate Items To Provide Organized Storage. Compartment boxes are made with prime cold rolled steel for strength that lasts. 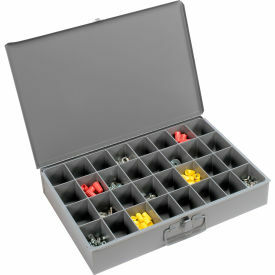 Small part storage boxes include high impact styrene inserts to separate container into compartments. Each compartment has a scooped bottom for easy parts removal. Lid features full length piano hinges for rigidity. Positive locking pull-down catch keeps lid tightly closed to secure contents in compartment. Storage boxes measure 18 W x 12 D x 3 H overall. Gray powder coat finish. Adjustable Compartment Boxes include removable dividers that adjust on 1 centers for customizable compartment sizes. 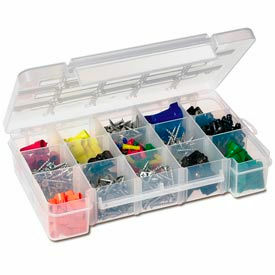 Plastic Compartment Organizer Boxes Are Designed To Store And Transport Small Parts For Workshops, Studios, Classrooms And More. Plastic Compartment Organizer Boxes are made of impact resistant plastic with transparent lids for clear visibility and long lasting durability. Lids latch shut for secure closure. Some models feature grid indentations on lids to prevent stored items from spilling into other compartments. 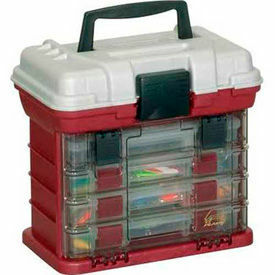 Waterproof storage containers include an O-ring seal to keep water out of supplies. Double-sided Organizers provide twice the storage capacity. Dividers are Fixed or Adjustable. Available with 1 to 104 Compartment Configurations. Dimensions vary per model. Plano StowAway Drawer Rack Systems Provide Storage For Accessories Such As Nuts, Bolts, Screws, Connectors And More. Plano StowAway Drawer Rack Systems are made of Polypropylene to provide long lasting durability. 2, 3 and 4 Box Systems available. Additional storage for small hand tools provided under lid. Color is Gray/Sandstone and Red/White. Dimensions vary.